This week on "Where Are They Meow," none other than the magical mister Faust! After a bit of adjusting, Faust has settled into his new home in Towson very nicely. In fact, his humans are so charmed by his cuteness that they've given him the nicknames "Pud-Pud" and "Puddin"! Faust now lives with his human parents and is the one and only kitty in the home. He loves soaking up all of their attention. 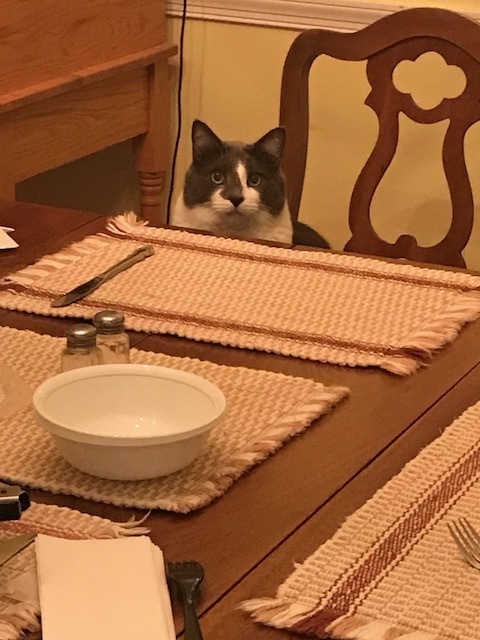 When he's not sleeping in boxes or seeking out cuddles, he loves to join his family at the dinner table! 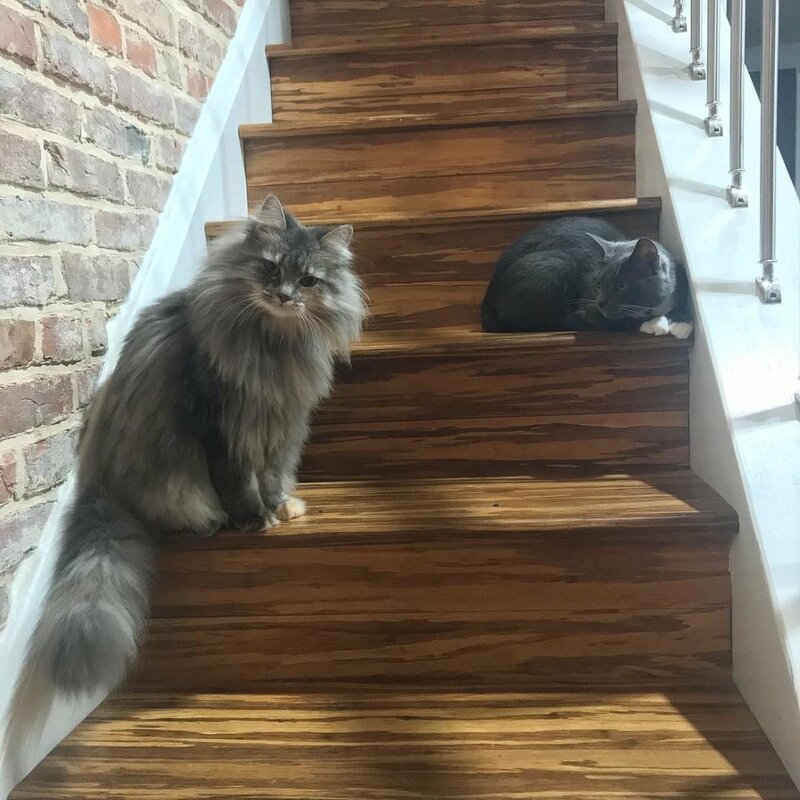 Up next on "Where Are They Meow," the gorgeously fluffy Flintstone duo, Pebbles and Bam Bam! Since arriving at their new Glen Burnie home in December, they have settled in wonderfully! 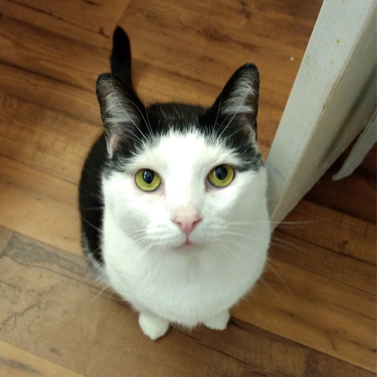 Bam Bam, the shyer of the two at the cafe, has really come out of his shell at home and beautiful Pebbles has allowed him to share in the spotlight. Together, they live with their human parents and their canine brother. Though the kitty/doggie relationship was a little rocky at first, they've come to mutually ignore one another; unless it's dinner time. Then all bets are off! 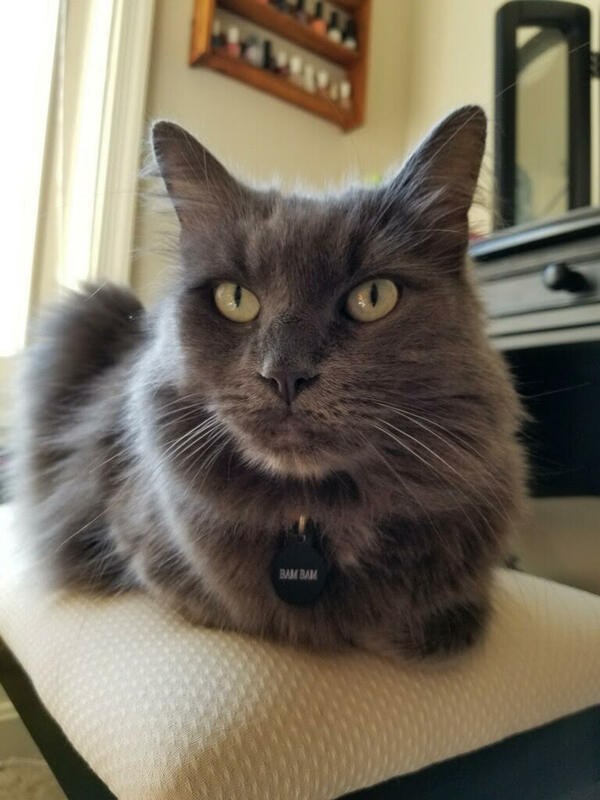 On most days, Bam Bam can be found exploring the home and chatting along the way. Pebbles, on the other hand, can be found quietly lounging on her humans' bed or seeking out snuggles. Chevy wasn't at Charm Kitty Cafe long before he was adopted. He will always go down in history as one of the friendliest cats we've ever had. Chevy has happily settled into his furrever home by Lexington Market since he arrived back in December and those that know him well call him "Chevster". He was a Christmas present for his human mom, Addie, who is also a volunteer at Charm Kitty Cafe! "Where Are They Meow" takes flight to Paris! Paris was quite a crowd pleaser while at the cafe, specializing in greeting from her cubby along the merch wall. She made the move to her Patterson Park forever home in early October. She now goes by Frida, or Little Girl to those that know her well. She lives with her human dad and cat sister Witchhazel. Her first month was quite an adjustment for everyone in the house but now they couldn't imagine it any other way. You can keep up with Frida and Witchhazel's antics at @witchhazel_thecat on Instagram.